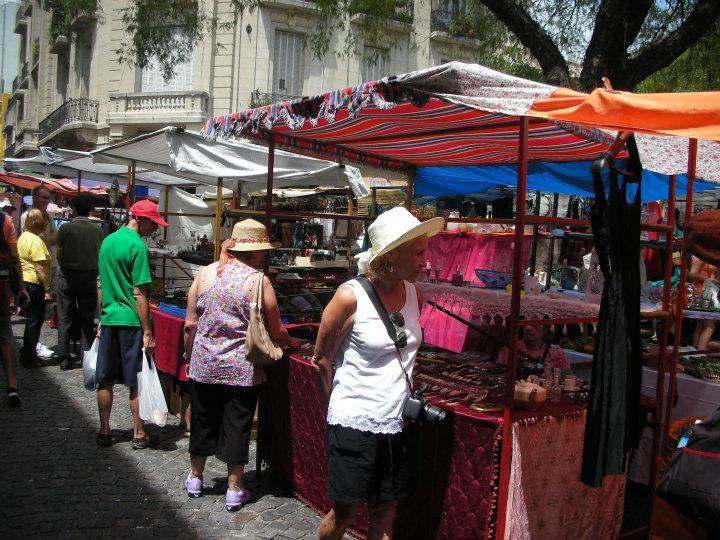 Market Day - Buenos Aires, Argentina - January 25, 2015 - Blog from Buenos Aires, Argentina | South America!! What a wonderful city! It is easy to see why Buenos Aries is often called the Paris of South America. It is fabulous! Its architecture is very similar to that of the great cities of Europe. Many of the streets and parks are lined with tall sycamores. Some of today's finest hotels and museums are former mansions/castles of the great wealthy families who once lived here. Fine shops and galleries are plentiful. There are many wide avenues, crossed by smaller more intimate streets with cool shops, bars and restaurants. The Avenue de 9 de Julio, celebrating Argentina's Independence Day, is reminiscent of the Champs de Elysee, only this thoroughfare is even more broad with 16 full lanes of traffic. The Obelisco, again in remembrance of Argentina's Independence Day and which looks very much like our Washington Monument, sits in the wide median between the lanes of traffic. Today was market day. All over the city, street markets of several varieties were open and are popular destinations. Before we left home we arranged our schedule in Buenos Aires just so we could take advantage of market day. We started the day with a good exercise walk. How fortunate we are - our little hotel happens to be located in a great neighborhood. On our walk we discovered that only a few blocks away the French, Brazilian and Italian Embassies are located all in beautiful stone buildings. And since today is Sunday, traffic was light and we could easily stop to examine a beautiful garden, a fence, an artfully crafted door or the window of an exclusive shop. We took a taxi to the San Telmo market (it only cost 50 pesos). This market has a lot of local art but the primary attraction is booths of small antique items like china, silver, crystal, knives and much more. I got it in my mind that I needed a small piece of silverware - you know, just a small tray or pitcher that once was a household item in one of the great, fine homes of immense wealth here in Buenos Aires. I searched and searched; I left no booth unexamined. But finally I decided NO. I'm not sure that was a good decision, but at least I don't have to carry more poundage all over South America at this early point in the trip. We did buy a small piece of original art and a refrigerator magnet. (My girls are going to laugh at that—I have many - one from almost every place we have visited). Next we went to the market at Recoleta, the foot of the Cementeria. This market featured handicrafts. There were many, many booths of beautiful one-of-a-kind jewelry pieces, plentiful varieties of the mate mug, lots of hand-woven scarves and wraps, crocheted baby booties and caps, highly decorated leather purses and bags, belts, hats, and much, much more. The booths lined the winding sidewalks of Recoleta Park and went on forever. There were many treasures, and everything was beautiful. There was music and again, we saw couples dancing the mysterious and highly intimate, the Argentinian Tango. We enjoyed a late lunch at a small neighborhood Argentine restaurant, El San Juanino, where our waiter was friendly, spoke a little English, liked us and loved saying "hasta la vista, baby!" to everyone. What a fine meal! Steak, like you have never tasted unless you have been to Argentina, and green salad with a lot of onion, carrot and tomato. I had a custom-made glass of iced tea. They made me a cup of tea then brought a small pewter cup of wonderful and rare ice cubes. Tomorrow we are off to the town of Tigre for a river cruise up the Parana River.